This year, 28 winners will be honored in the SIIA’s CODiEs for education technology, the 30th anniversary of the competition. A record 157 finalists were announced Monday for the awards that recognize excellence in software development. The finalists represent applications, products, and services from developers of educational software, digital content, online learning services, and related technologies across the K-20 spectrum of education. The growth of CODiE nominees is a “matter of more educational products coming onto the market, and our introduction of more categories,” said Karen Billings, the vice president of the trade association’s education division, in an interview. Some categories had more than 50 applicants, according to Billings. The category with the most nominations was “best educational apps for a mobile device,” which had 11 finalists, she said. The number of finalists was proportional to the number of applicants in an award category. Other top categories for the number of entrants were: “best PK-12 personalized learning solution,” and “best reading/English/language arts instructional solution.” Another category that drew significantly more applicants compared with last year was “best education cloud-based solution,” she said. Besides selecting which software nominees will be considered for evaluation, the SIIA must identify judges. This year, 245 educators were selected to review three to five products each in areas for which they are qualified, she said. Every product is scored according to an established rubric by two judges to be fair. For educators who serve as judges, it’s an opportunity to learn more about the products, and provide input that could go into product revisions, Billings said. Sometimes, evaluating products can help educators determine which ones they want to test further or eventually purchase, she said. After the judging, some companies will extend the use of their products for a period of time to reviewers who are interested in learning more, or they might invite a teacher or administrator who is impressed with a product to serve on an advisory board. “It depends upon the publisher,” she said. These arrangements are not an expected part of the judging process, but they can be an outgrowth of it. The awards are represented internationally both by applicants that want to sell products in the United States, and by educators who want to judge, Billings said. “We’re getting a lot more international and global reviews from judges,” she said, with applicants from cities like Barcelona, Spain and Abu Dhabi, United Arab Emirates. So, where in the world is “Where in the World Is Carmen Sandiego” today? We found a mention of the once-popular game on Houghton Mifflin Harcourt’s website, and Jennifer Berlin, the company’s communications director, explained in an email how the rights transferred through the ownership odyssey of various companies. Carmen’s creator, Broderbund Software, was acquired by the Learning Company in 1998. Three years later, Riverdeep bought the Learning Company, and then Houghton Mifflin in 2006, creating HM Rivergroup. Through more acquisitions, Houghton Mifflin Harcourt was formed, and ownership of the game transferred with it. 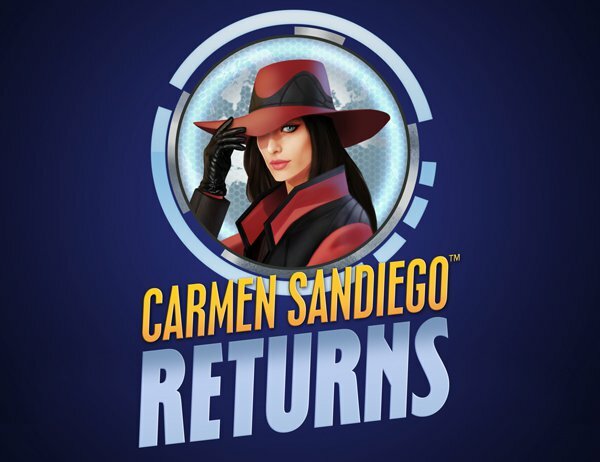 What became of the Carmen Sandiego product itself? A Windows 8 game that uses Intel’s RealSense technology will be launching this spring, according to Berlin. Stay tuned for developments about an iOS app. The whereabouts of some of the other ed-tech winners over the years will be revealed by SIIA as part of the final awards ceremony. Billings said it looks like some winners are no longer in business, but most are. Some have been acquired. It appears that tracking them all down will amount to an ed-tech investigative job, reminiscent of “Carmen Sandiego” game players who learned about history, geography, or other subjects, as agents of ACME Detective Agency trying to capture Carmen.